​Burrs and Cones. Both of the trellises in the Boiler Hopyard have begun flowering and coning. 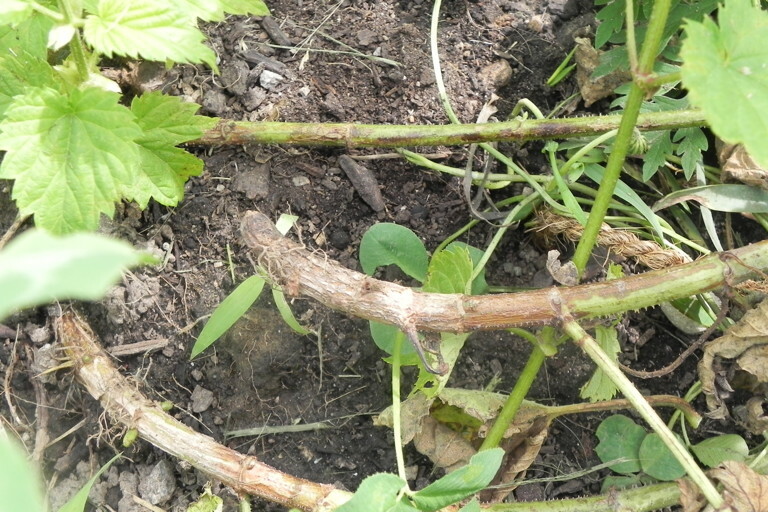 The primary shoots were pruned at the top of the net on the dwarf trellis in order to promote lateral growth. The pruning took place on May 19 and again on May 28. The bines on the dwarf trellis have been flourishing with flowers and now cones. Out of the six cultivars in the hopyard, Galena was the first to reach the top of the dwarf trellis and begin flowering. The tall trellis began flowering in early June along with the dwarf trellis, but after adding the last dose of nitrogen the plants in the tall trellis began putting on more vegetative growth, including lateral branches. This appeared to delay flowering and allowed for more lateral growth development. The plants in the tall trellis are now in full bloom and appear to be several weeks behind the dwarf trellis. Apple Mosaic Virus. Apple mosaic virus (ApMV) is a common pathogen that is found worldwide with a broad host range. ApMV has been identified in the Boiler Hopyard (Figure 1). 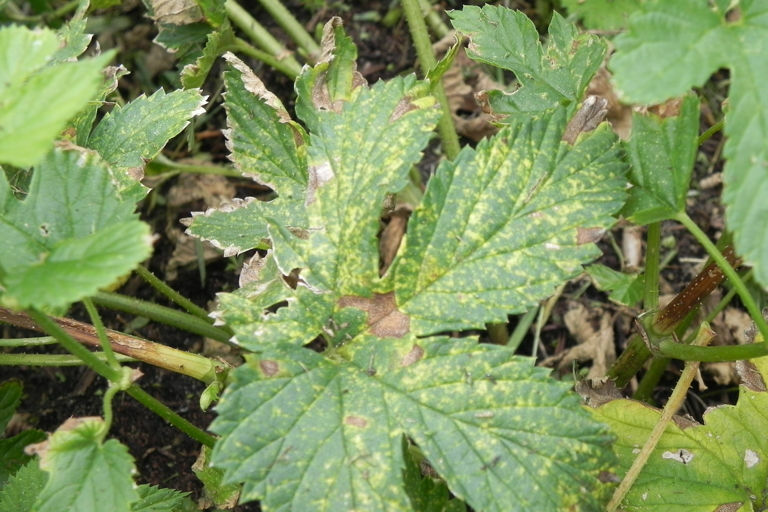 Symptoms of this virus include chlorotic ringspot that can turn necrotic, and/or yellow speckling on leaves, as well as a reduction in cone yield and alpha-acids (Figure 2). Symptoms can vary among cultivars with some displaying no symptoms at all. Disease severity can vary among cultivars, climates, and even seasons. Although viruses are commonly transmitted through vectors such as insects, ApMV has no known vectors and is spread through sap and plant-to-plant contact. The spread of ApMV through hopyards is generally slow because spread is often between adjacent plants. This virus can be spread by routine field activites such as mowing, pruning, stringing, training, leaf stripping and thinning. Prevention is the most effective method against ApMV. Begin by establishing hopyards with certified virus-free materials. After detection of ApMV, control the virus by implimenting proper sanitation methods. Infected plants should be worked last to avoid spread. Before moving from an infected portion of the field to a disease-free section, equipment should be cleaned of all plant debris, and sanitized with a disinfectant labeled for that use. Removing and destroying plants that are severely stunted or yellowed should be considered. The infected plants in the Boiler Hopyard have yet to be removed, but will receive special treatment to avoid spreading the virus. Fusarium Canker. Fusarium canker has been discovered in the Boiler Hopyard (Figure 3). Infected bines can be identified by sudden wilting and a swollen base near the crown. The bases of infected bines swell and eventually girdle near the crown causing it to easily detach (Figure 4). Fusarium sambucinum, the causal organism of Fusarium canker, is ubiquitous in the soil and has a broad host range. Fusarium canker can appear sporadically throughout a hopyard and growing seasons. Plants which appear healthy can develop canker. Canker has been associated with fields with poor drainage and/or heavy rains. A lot of canker has been observed in the Boiler Hopyard this year, which is probably due to heavy rains this spring and summer. Bines that were in full bloom have suddenly wilted and died. This can have major effects on yield. It is thought that this disease affects plants primarily through wounds at or below the soil line, which could be created from a tractor, sprayer, wind, or insects. These wounds are entry areas for F. sambucinum, and cankered bines should be removed from the field. Preventative measures such as avoiding bine damage during planting helps decrease the risk of canker. F. sambucinum can also cause Fusarium cone tip blight. This disease has yet to be reported in Indiana. Potato Leafhoppers. Potato leafhoppers made their appearance in Southern Indiana as early as May, and have been present in the Boiler Hopyard since mid-June. This insect overwinters in the south, and migrates northward in early spring. Potato leafhoppers are lime green, 3-mm-long insects that feed on the veins of leaves with their sucking mouthparts. They are not hop specific as they feed on over 100 cultivated and wild plants. This insect uses its sucking mouthparts to probe around plant vascular tissue. 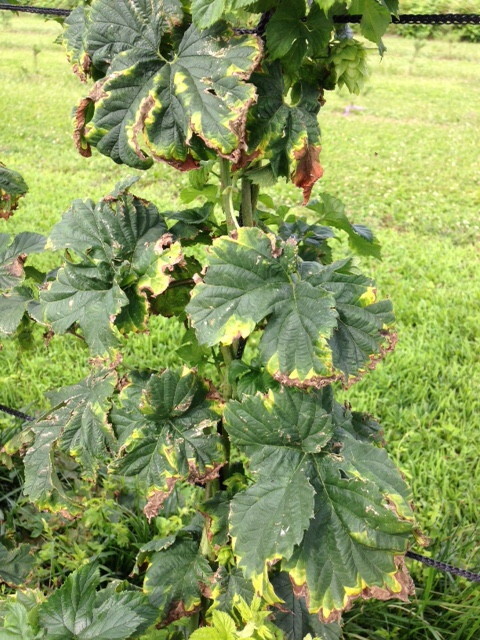 Damage from this pest is notoriously characterized by marginal chlorosis and necrosis on the leaves (Figure 5). This V- shaped pattern is commonly referred to as hopper burn. Potato leafhoppers have been a minor pest in the Boiler Hopyard, and have not required any chemical management practices. This is likely due to the very wet/humid conditions and mild temperatures Indiana has experienced this season. Symptoms were most severe this season in the cultivar Mt. Hood. Infestations in Indiana hopyards may be specific to cultivars, and not uniform throughout, which requires more thorough scouting. While monitoring hops, carefully check the backside of leaves, looking for these small, wedge-shaped hoppers. The adults, with wings, are very skittish and will fly if disturbed. There is not an established threshold for potato leafhopper in hops, but it has been suggested that an average of 2 leafhoppers per leaf may induce hopper burn. Looking Ahead. The Boiler Hopyard will maintain a routine downy mildew spray schedule until harvest. With that being said, it is important to start considering pre-harvest intervals for pesticides as potential harvest dates in Indiana are rapidly approaching. Our next field day at Meigs Horticulture Farm south of Lafayette, IN is scheduled for August 3. The event will involve many of the demonstration and research plots that are managed by the Specialty Crop Systems Lab at Purdue. The Boiler Hopyard will be available for viewing during the field day.ReferencesPurdue University Field Crops IPM. Potato Leafhopper. http://extension.entm.purdue.edu/fieldcropsipm/insects/sg-potato-leafhopper.php . Wilson, C.R., Pethybridge, S.J., and K.C. Eastwell. 2009. Diseases Caused by Viruses and Viroids. pp 39-41 in Mahaffee, W, S. Pethybridge, and D. H. Gent, eds.ˇCompendium of Hops Diseases and Pests. APS Press, St. Paul, MN. Eastwell, K. and C.M. Ocamb. 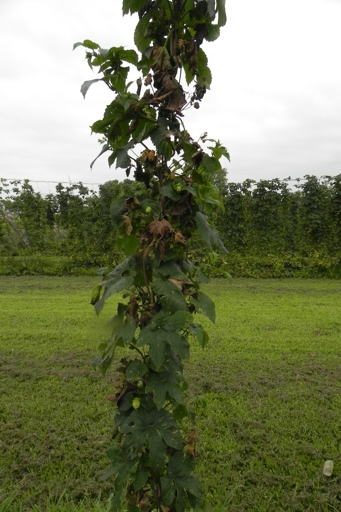 Hop (Humulus lupulus)-Virus Diseases. in Pscheidt, J.W., and Ocamb, C.M., senior editors. 2015. Pacific Northwest Plant Disease Management Handbook [online]. Corvallis, OR: Oregon State University. 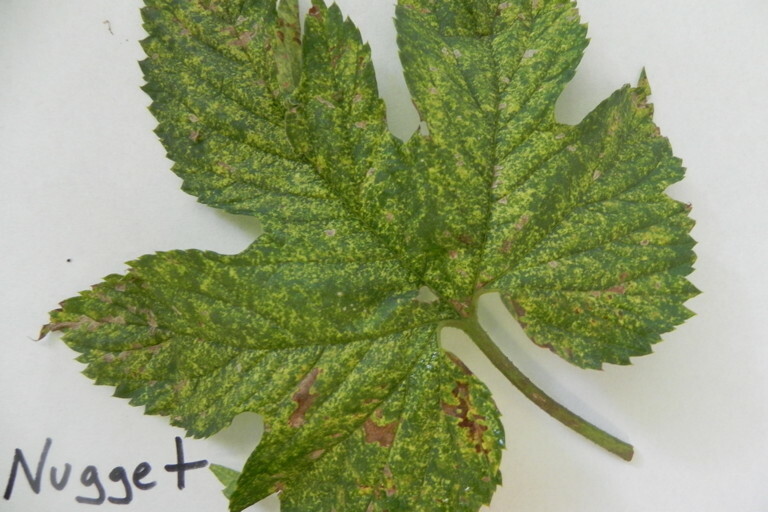 http://pnwhandbooks.org/plantdisease/hop-humulus-lupulus-virus-diseases. (accessed 7 July 2015).Ocamb, C.M. and J.C. Bienapfl. 2009. Diseases Caused by Fungi and Oomycetes. pp 23-24 in Mahaffee, W, S. Pethybridge, and D. H. Gent, eds.ˇCompendium of Hops Diseases and Pests. APS Press, St. Paul, MN. Figure 1. Apple mosaic virus. Figure 2. Apple mosaic virus symptoms. Figure 4. Swollen base of infected hop bine. Figure 5. Symptoms of leafhopper feeding on hop leaf.